As a freelancer working in ELT publishing, it’s always thrilling to spend a day investing in professional development. This time last year, I attended ELTjam’s LXD (Learner Experience Design) 1 day course and a year later, I was looking forward to building on my user design knowledge. Inspired by ELTjam’s UXD input, over the past year I’ve become passionate about developing solutions which engage people and which have the learner or end user at the heart. My journey was an ‘experience’ in itself. All journeys away from the comfort of my desk feel intrepid and exciting. I’d been super organised and to save time, I drove to Shepherd’s Bush, parked the car and took the Central Line to Stratford. I launched Google Maps and was delighted to have reached Stratford in good time. I was mesmerised by the silver bauble decorations in the Westfield Centre and ignored the lure of the shops and returned to Google Maps to complete the final leg of the journey. At this point in my journey, I learnt my first nugget of useful information: the combination of Google Maps + walking on foot makes for a bad user experience. The Google voice in my headphones took me in the wrong direction, across dual carriageways, round in circles and even told me to do a U-turn whilst crossing a road. So, after an hour of walking in the rain, I gave in and ordered a taxi. The taxi experience was a fantastic example of good user experience. A freephone number in a supermarket put me straight through to the taxi company and my personal chariot arrived within seconds. The taxi driver gave me tips about which underground station to use next time and we arranged for a collection later in the day. The whole experience was a delight and the addition of the human element was the essential design feature that continued throughout the whole day. 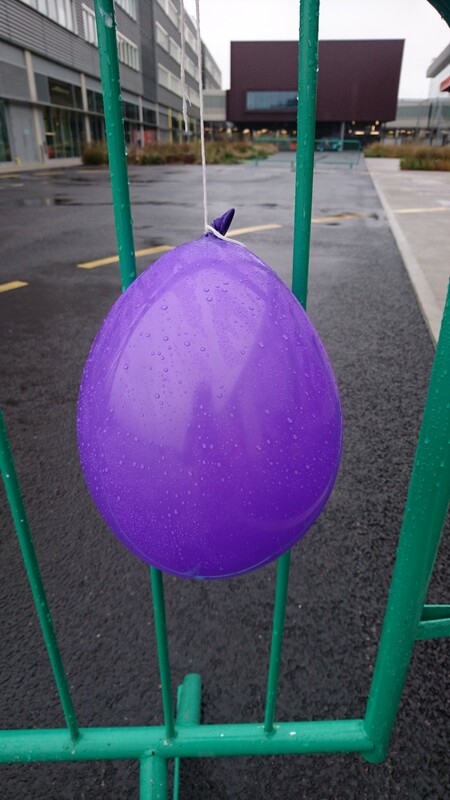 After this small travel blip, I spotted a purple balloon which was a certain sign that I was close to the venue. I was greeted by a sea of purple as Tim, Laurie, Jo and Berta from ELTjam welcomed everyone to the venue. It was time to relax and enjoy the start of an inspiring day. ELTjam events are always memorable, delightful and fun. The post-it notes and pens encouraged us to add our thoughts to a communal flipchart and there were emoji stickers on a desk so we could personalise our name badges! The coffee was flowing and we all relaxed. The ground floor hub was buzzing with teachers, publishers, designers, editors, start-ups, exhibitors and sponsors. Having the opportunity to talk to ELT publishing colleagues was wonderful and talking to Twitter followers and friends in real time was worth the conference fee in itself. The design of the conference programme gave you the opportunity to plan your own personalised route through the day. I had pre-selected my conference journey in advance but made a slight change after learning that Rose Luckin was still on her way back from Australia. Even the best planned routes have to change course in an agile, responsive way. The panel session led by Sophie Bailey from The Edtech Podcast was a fantastic start to my conference journey and provided multiple perspectives and viewpoints on LXD. Amit Patel from Experience Haus provided valuable insights into design process and start-up development. Hearing about data analysis from Caroline Thiriau at CUP gave further confirmation of the crucial need to put the learner at the heart of everything we develop. Ed Jones’ session on screen design was incredibly useful and I came away with a new understanding of the design principles, layout, typography, key vocabulary and concepts behind good user design. I ended by watching Paul Driver wow the audience with a demonstration of VR and this was one of the best sessions of the day. I just had time to speed test the colourful Kano computer kit before grabbing a delicious brownie and heading home. My return journey was smooth and relaxing and without any technical glitches and I was left feeling inspired after an incredible, delightful, fun day of learning and human connectivity.